We did a quick Q&A with BONEHEAD, who are opening our next residency show at the Lager House, TOMORROW, Thursday 3/26 at 9pm with Growwing Pains, Sharkmuffin and Jenny Junior. People in the band are: Terra Gillis on vox and tambo, Alexandria Berry on bass, Matt Pitcock on drums and Alexandra Lary on guitar. Me- Alex L has been recording music alone and with other people for around 7 years…this Detroit incarnation came about after me and Terra had been writing and jamming songs and we found Alex and Matt through magical circumstances to come together to have an amazing live band for the songs I had been writing. decided on the band name cause its what my dad calls me whenever i come back home. think it suits the primitive style/sound of the band. We have some rock and roll songs, some cool punk stuff, a couple secret ballads and some noise jams. A bunch of high energy songs, I try to avoid being bored as much as possible, dont want the band or audience to be bored ever, unless I purposely want to bore them! What bands (or other) are your influences/inspiration? im a huge fan of 77 punk and kbd. 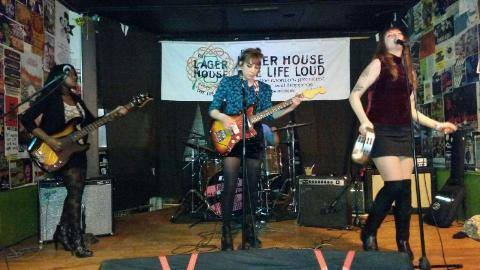 Girl group stuff like Joe Meek, new Goner records bands. Jay Reatard, anything made for people with ADD or people that love love and romance. Anything with attitude and emotion. Our favorite Detroit bands are!! Feelings, Casual Sweetheart, Rebel Kind, John Krautner, The Cheetahs, Human Eye or anything Timmy vulgar does! Anything else you want everyone to know about your band? 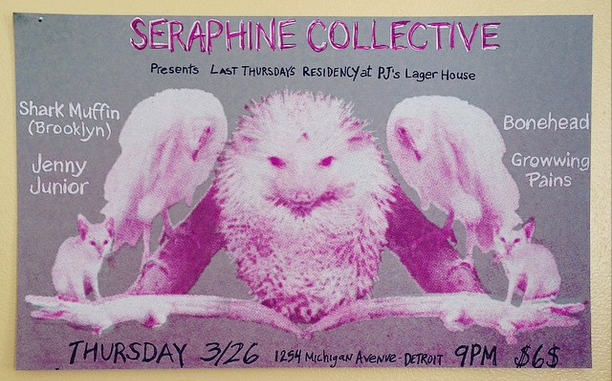 We love the seraphine collective and all the bands involved and are super psyched to be a part of this showcase! !